How much inventory to take to a craft show is a question I have been getting a lot lately, so I’m going to tackle it here today. There is nothing worse than going to a craft show and doing well and then running out of something that is the hot seller of the day. While, believe me, you can’t always predict what your hot seller will be from show to show, you can at least try to plan from your previous shows. If this is your first show you might have to guess a little more. However, if you sold in any other venues think about what sells well in those venues. If this is your first selling experience, then consider what people compliment you on or what your friends or coworkers have asked if you would make them when they see you wearing it. Don’t necessarily count on that, though, because without exception – no matter how much of something you bring – there will be people who wanted it in the only color you don’t have. No matter how much you end up deciding to take with you, start working on your inventory well ahead of time. If you start doing more and more shows you’ll eventually just have to supplement and replenish what you sold at the previous show, but it can seem pretty overwhelming at your first show. Make a plan of how much you want to bring (we’ll talk about this in a moment) and then make a plan on how you’re going to be able to complete that amount of items in the time you have. Figure out how many pieces you need to make each week and even each day if that’s what you need to stay on track. Don’t forget about actually tagging items, too. That can be time consuming as well. Even if you don’t reach your total goal, take as much as you can. You can’t sell if you don’t have it with you. Here’s a little caveat, how much you take will vary based on what you sell and your brand. I sell jewelry, so I mostly have in mind jewelry when I’m writing this. Jewelry is light and easy to carry. So if you sell something light, it’s always a good idea to bring as much as you can, even if you don’t put it all out right away. If you sell something large or heavy, you may have some restrictions because you can’t fit as much in your vehicle or even in your booth. It’s still good to have more than you think you will sell. 1. How much did the show cost? I don’t always necessarily find this true, but there used to be this thing where you should plan to sell 10 times more than the show cost. So if you paid a $100.00 fee, then you should plan to sell $1,000.00. This is not always the case, so don’t feel crushed if that doesn’t happen for you. I have had different shows where I have sold less and shows where I’ve sold more than that. It’s a good starting point for deciding on inventory. 2. Then multiple that by 2. So in our example, that would bring us up to $2,000.00 worth of inventory. If this number seems high to you, don’t panic. This is just a goal. I always say you should have more than you plan to sell. Think about it this way, when you go shopping, if there were only a few things left to choose from you might choose nothing. So we have to have more than we plan to sell. If it’s a busy show you can keep replenishing your booth with new inventory as you sell it. If it’s not a busy show, well then you’ll have to make less for the next show. If you’re worried that you’re just starting and you’ll be putting a lot of money into untested products, then adjust accordingly. This is just a guide. Or perhaps do some smaller shows and take less inventory to get started to test out what sells well. 3. Now, how many pieces do you have to sell to get to that number? On average, what do your pieces cost? I understand that you probably have a range of prices, but thing about the middle priced item perhaps. Let’s say that’s $40.00. So to get to $2,000.00 you’d need 50 $40.00 priced items. If you know you sell a lot of items that are $20.00, then maybe use that as your guide. Or maybe just work it out that you’ll take 40 $20.00 items and 20 $40.00 items and then a few more expensive pieces. This is not an exact science. It’s just a guide. So don’t get too worked up about figuring it out to the exact dollar. And I would decide how much of each I wanted to take. I would list what specific styles and colors I wanted of each (and specifically how many). Then I would see what I already had ready to go. I would cross off what I had already from that list. And then I knew what I needed to make. As I completed items, I crossed them off. Yeah, that is pretty freaking organized and you may think it’s overkill. It probably was overkill for some shows, but for others I was glad I was that prepared. Frankly, you won’t need that list as you get comfortable with shows. I always did it because it always helps me to focus to have a list where I can check off things. You can use my suggestions as a guide and pick and choose what works for you. If this is your very first craft show, just take as much as you can and don’t get upset if you don’t reach that number. If you have more inventory than what I suggested: great! Take it! You certainly can’t sell it if you don’t have it. 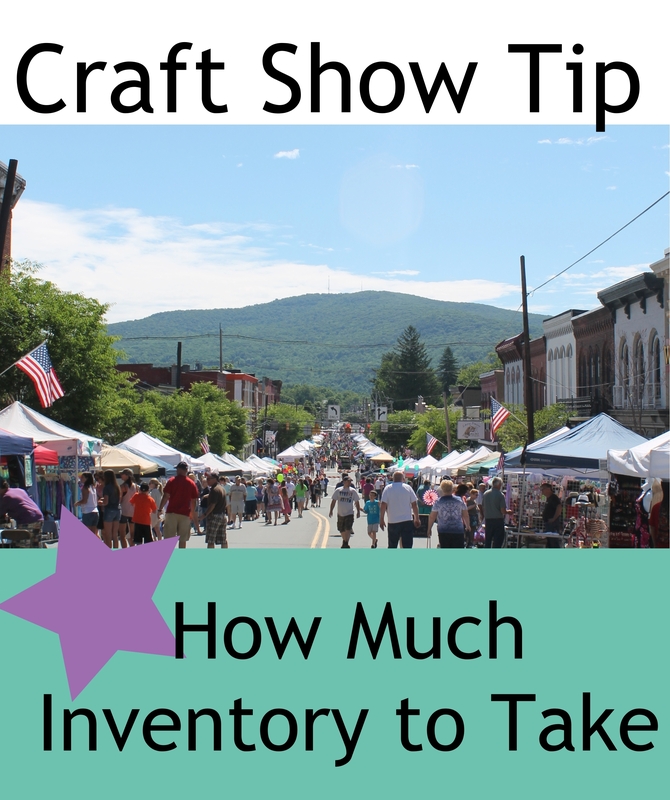 As you do more and more craft shows you’ll get better at predicting how much inventory you’ll need. Getting ready for your first craft shows? My suggestion is to be prepared. 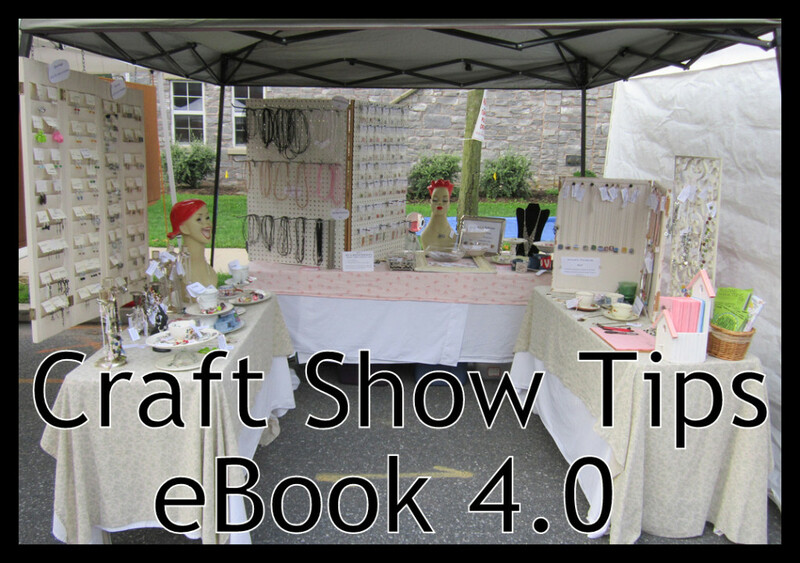 And my Craft Show Tips eBook will help you prepare! This entry was posted in Business, Craft Show Tips and tagged art show, craft fair, craft festival, craft show tip, craft show tips, how much inventory to bring, inventory by Kimberlie. Bookmark the permalink. Thank you for this article! I found this super helpful! Thanks for Your article, it has been of great help. Now I got to figure out how to fit on my car all the items that I need. I’ve paintings and string art. An a bety small car. After four years of doing craft shows with my stuffed creations, I can attest to some of this – always bring about twice the inventory you want to sell. I frequently will sell 50% of what I bring, dollar value wise. Also, big fun pieces are awesome, but if you only have one, it’s not likely to sell, because there are no choices. Even having two ride on hippos means I will probably sell one, where as if I only take one, no matter how cool it is, it probably won’t sell. Also, mix it up! Don’t bring the same things to every show, some people will be coming to multiple shows and will be excited to stop by your booth and see the new stuff. 🙂 But that’s a whole different article. I find that once you start doing shows it helps gauge what to bring just by talking to other vendors. My major spring show i got into is a 300$ booth but is out of town and incredibly busy and with people really spending so ill be bringing a minimum of 12 000$ in stock. I dont usually sell 50% of my inventory but thats because of what i sell. Making sure your display looks pretty full and you can keep adding stock through the day is very important. This was very helpful. I am planning to sell soap. Should the same rule apply?